When you’re gaming, especially if you’re gaming on a laptop or a desktop computer, you need to have a little space to do so. Most people need some space for a mouse (and by that I mean a real mouse, not the mouse pad or trackball that comes with most laptops standard) and a keyboard, as well as for the laptop or the desktop tower. If you’re using a desktop, you also need to have some space for your monitor as well. My point is that you need a lot of space and that you probably don’t want to be sitting on the floor and trying to game. Trust me, it is not a comfortable position for gaming over the long run. You need to have a table. More realistically, you need to have a desk, one from which you can game without having to worry about sharing space with a bunch of other things (and one where you have your drink and food carefully sequestered AWAY from the keyboard, at that). But picking out the right desk can be something of a hassle, just due to how many desks are out there vying for your money and for your space. How are you to choose the one that will give you the space that you need in order to be able to game efficiently? Have no fear, fellow gamer; this guide is here to help you figure out it. For testing, we took a game, a high-end backlit gaming keyboard, a decently powered gaming laptop, and a gaming mouse, and played a bit on the various desks. Now, before we begin the list, and talk in detail about what desk may be good for this or that and what desk is the best gaming desk, let us first take a look at a table that will help to inform you better about the desks that were reviewed. So without any further ado, here are the best gaming desks available today. Oh, and we were just kidding with the title. A gaming desk is definitely worth it if you want extra dedication for your build. This is just a good and quick look at the products that we are going to be reviewing, but hopefully it will give you enough basic information about every one of the desks that we are going to look at so that you will be able to figure out which of the gaming desks we reviewed are things you might be interested in purchasing. Now, let us take a closer look at the various desks that we viewed. If you take a look at this desk, it makes it pretty clear that the desk is designed for one thing, and one thing only; gaming. 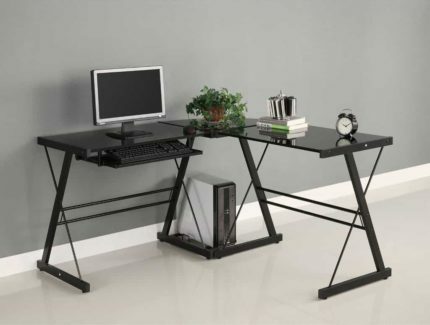 You might find other desks on this list that is good for gaming, as well as desks that you might be able to use to get some work done, the gaming desk that we’re looking at right now is a creature designed around the idea of gaming, and that is a design for which it is quite successful. The desk measures almost 27 by 50 inches, which is basically saying that it’s 2 feet by four feet, with a bit of change. That is about the size of the decent coffee table (though this desk is a good deal taller, which is a good thing), which means that you are going to have plenty of space, but even better, there are a couple of little platforms and hangars designed for various things. There is a platform designed for hold your monitor or your television (depending on which one it is that you like to use for gaming, I’m not here to judge), a little rack that is designed to hold a couple of games and two controllers or so, and even two little side platforms that are built there to hold speakers. It even has a built-in cup holder and a rack on which to hang your headphones (if you use such things) and a nice little angled holder for your favorite mobile devices, like your cell phone, tablet, and your 3DS. 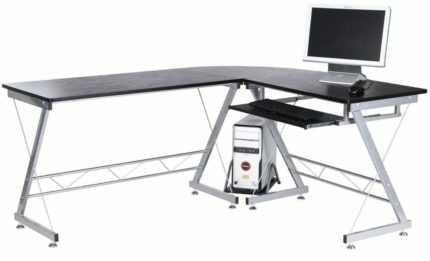 So when it comes to gaming computer desks, how does this one perform? Admirably, to say the least. It has all the space you need, it has plenty of nice little racks to hold things that take them off the surface, it keeps your drink AWAY from anything that it could actually damage, and best of all, it allows you to enjoy your gaming as it was meant to be. In short, this is a perfect gaming desk for anyone and any gaming that you could consider. Literally nothing to complain about here. Let’s be quite honest here, this is the first desk that we’ve reviewed on this list that actually looks like it would not look out of place in an office. The Atlantic Gaming Desk is obviously for the college-aged crowd or for the serious gamer, and not at all for the business place. This desk is great, though, especially because it can be both work and ‘play’ station (clever turn of phrase, wouldn’t you agree?). Sure, it has the demeanor of a desk that is designed for work, but it also is designed to have plenty of space. Put your monitor on one side of the desk, maybe by the bookshelves, put your tower under the desk or behind it (or in the bookshelves, if it will fit there) and away you go enjoying the gaming experience. There’s plenty of space for your keyboard, and whether you’re left or right-handed, you’ve got plenty of space to move your mouse around as well. The construction is wood, which is by far the most common material in the construction of these desks, but it also has that lovely bookshelf at the end to make up for the commonality of the construction material. Indeed, the bookshelves are a nice touch, especially for those who are doing a lot of reading or who would just like some extra storage space on hand, but even better is the L-Shaped design of the desk. For example, on the left portion, keep your computer rig (including your keyboard and mouse) and on the right, you could safely keep your soda and your favorite snack without worrying about spilling or crumbs. Pretty great idea, right? If you’re looking for an affordable desk that can be at home in a professional setting or look classy in your home office, here is a great one for you to consider. I won’t say it’s the ultimate computer desk gaming rig, but I will say that it’s one that looks like you could actually be doing work at it. 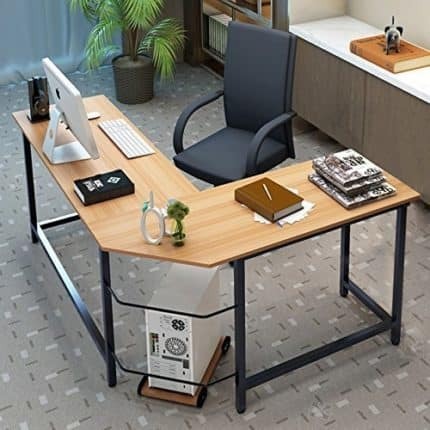 Simple construction, metal, and tempered safety glass, combine to give you a desk that not only looks like the kind of no-nonsense and no-frills desk that a forward-thinking minimalist executive would have in their office, but also a desk that would seem at home in almost any home. To begin with, it has really three desks rolled into one (alright, let’s be fair, two desks and a little side table). The construction may look flimsy or minimalist, but really, it’s quite well built, and the steel frame is more than capable of holding up, in perpetuity, not only the tempered safety glass that rests atop the frame, but also the devices you may put up there. One great thing that we have not seen yet is the little keyboard drawer, which allows you to keep the keyboard at a comfortable height until you don’t need to use it. But if you do a lot of gaming, you might find that you end up not being quite so happy with the way that it is positioned; having the keyboard at one elevation, and the mouse at another, in my experience, makes you feel weird, and can cause you to over-compensate in movements with the mouse until you get used to it. Still, you’ve got plenty of space, yet again, for your monitor and your keyboard and mouse combo on the desk. Not necessarily to say that this is the best gaming desktop that 2017 has to offer, but you will find it is a good marriage of a gaming desk and a work desk, and one that looks good in the office and in the home and saves a lot of space which is always a nice plus. If you’re looking for a desk that you would never want to have at your office, and one that looks like the things you see people playing on in tournaments thrown by the MLG organizations (Major League Gaming, which they seem to be convinced is going to become an arena sport, even though people cannot seem to find enough interest to make paintball a viable spectator sport, and that requires actual movement and a fair amount of physicality), then this is the first desk that we’ve looked at that really looks appropriate. 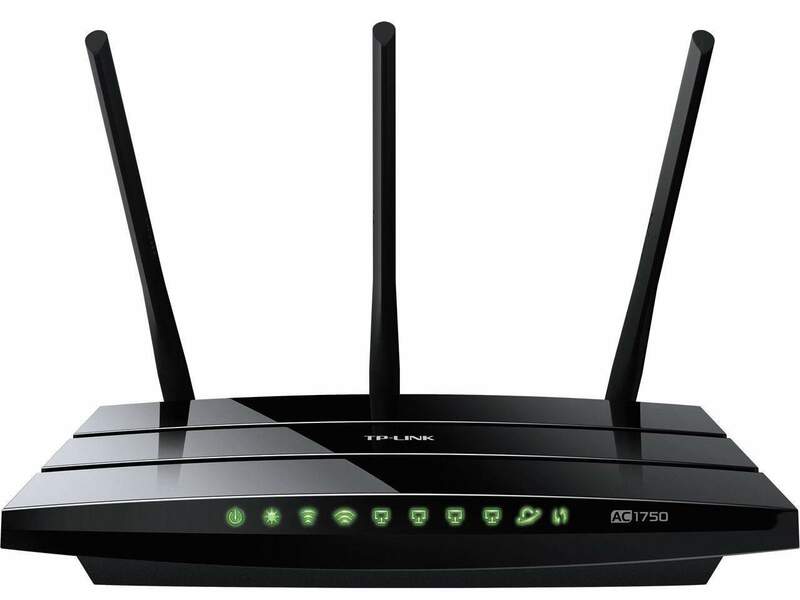 Be honest with yourself; can you not imagine a row of five of these at a CounterStrike: Global Offensive tournament, with five players taking on another five players in competitive gameplay? This is a fairly expansive desk that will easily fit your tower, your monitor or television, and your keyboard and mouse combo. 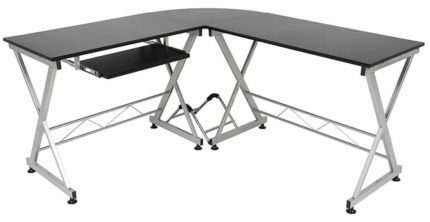 But that being said, if you’re looking for something that you can use both in a gaming and a professional situation, this is not the desk for you. 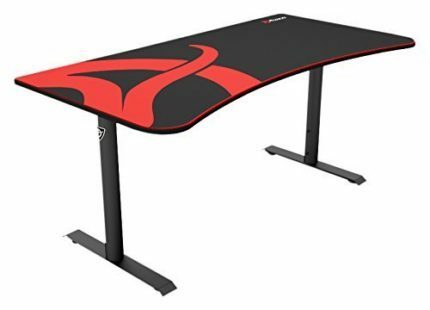 There’s something about this desk that just screams ‘I am all about gaming’, and the logo, which kind of reminds me of the ASUS ROG (Republic Of Gaming) logo, does not scream ‘I’m a professional and you should take me seriously in this workspace. As a quick aside, the little curve out of the desk is very comfortable and makes it a lot easier for you to be able to get to your keyboard and mouse, and makes you feel much more comfortable. Is it the best gaming desk 2017 has to offer? Perhaps, but it is also the one desk on this list that really cannot be ever mistaken for the desk of someone in a business environment. That’s right, it is yet another of the lovely L-shaped desks. But this one seems to be a bit different in a few ways, which will be made apparent here. To begin with, it’s all glass and metal. What that really means is that the entirety of the framework is made out of sturdy metal, and meanwhile, the surfaces are all made of what looks to be tempered safety glass. And that is a good thing because tempered safety glass stands up to a lot more damage than the average piece of glass that may be in your window. This desk has a nice elevated platform, which an act as a bookshelf if you’d like it to, but in my opinion, it is a much better place for you to put your monitor. That allows you to use the are under it as a keyboard/mouse area, which puts you close to the action on your monitor while also giving you a decent surface area to operate your gaming devices in. Of course, that comes with a problem. There is a little shelf here that is obviously built to be used as a keyboard drawer, and that means that, if you decide to use that little ‘bookshelf’ as a monitor shelf, you are going to end up with nothing to use the shelf for. Maybe use it to hold pens and paper and stuff like that? I don’t know. Anyhow, as I’ve been saying, this whole thing is well designed, and it could make a great game desk in a variety of ways. Whether or not it is the best gaming desktop is open to debate, but at least, unlike our last offering, you can have this in your office at home or at work and it won’t look unprofessional. Another attractive option, another L-shaped desk. However, to its credit, this one seems even more minimalist than those that have come before it, which is always interesting to see. The only problem that I really have here and the only problem that I have had with any of these desks so far is that some of them were not wide enough for you to be able to have a decent play area. 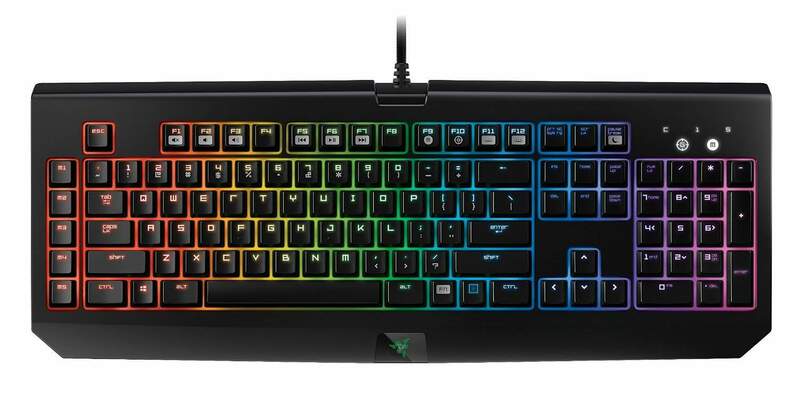 I know, I know, I can see that this thing has its own little platform/drawer for the keyboard, but as I’ve mentioned before, if you’re trying to game with your keyboard on one level and your mouse on another, it can get really weird, really quickly, and you may not like where it leaves you. In general, I found that until you get used to gaming like that, it throws off the sync between your two hands, and even has some impact on your perception of the game, which is not a positive thing. The one thing that was really done differently here, though, is the way that they designed the top. The top is basically one big piece, instead of a couple of perceptibly separate pieces like with a lot of these L-shaped desks. With the other L-shaped offerings, the desk seems to be very open about where the break is between pieces, and there seems to be space that would allow, for example, spilled liquids to fall to the floor, rather than allowing them to go on to the next portion. It may seem like something fairly minor, but when you have a spill on a desk that has a lot of expensive electronics on it, you are going to find that it can quickly do a lot of damage. All told a great desk for gaming, and a decent one for work, too. Yes, it’s another corner desk, this one made by ‘Best Choice Products’. I know that there seem to be a lot of them on this list, but the reality here is that for the most part, they are the best design for a desk that is good both for gaming and for working. This desk doesn’t really do anything that the other desks didn’t do. It’s got the usual basic frame with not too much extra. The top is made of some sort of wood (probably some sort of multi-layered wood, too, given the price point), and that wood while it may not be the best of woods, is still decent enough looking. The desk includes the usual keyboard drawer that everyone seems to be alright with and seems to like to utilize. I don’t know why they continue to do that, and this particular keyboard drawer even seems to be a little smaller than most. As I’ve said, if you are looking to do some gaming, you are going to find that having a keyboard at one elevation and the mouse at another will make the whole ordeal stranger and a bit less comfortable, but I guess it is what it is. The one problem that I have with this desk, in particular, is that it seems to be a whole lot thinner than that offered by much of the competition. I know that this is not the kind of thing that everyone will have a problem with, but when I’m gaming, I tend to like to stretch out a bit, and with this thin of a desk, that is not something that is going to be possible to do. So, in general, I would not really recommend this desk to anyone who enjoys stretching out, but if you’re looking to be able to enjoy a compact desk that will also have plenty of space, you’re going to be just fine with this model. 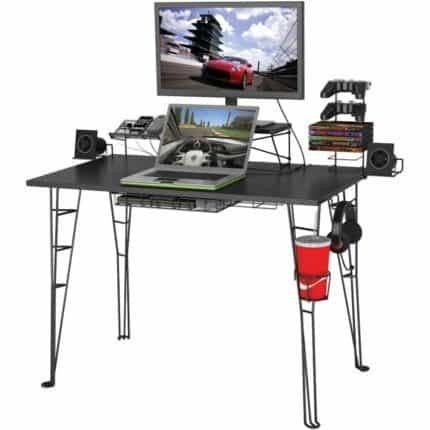 For our final entrant, yet another L-shaped desk that is good for both gaming and work uses. To be quite honest, I think that the L-shaped desk is such a great design for one big reason. It allows you to basically have what amounts to two desks at once. You’ve got your main desk, with your keyboard, your mouse, and your monitor on it, and maybe a few of the usual executive tchotchkes, and then you have your other desk, which you may use for your writing, or for holding documents you’re reading through, or any variety of things. It also gives you a nice separation between workspaces, and a decent place for you to be able to, say, enjoy a snack or hold a drink without having to worry about what happens if your favorite soda were to spill. Anyway, this desk doesn’t have that keyboard drawer. Is that a good thing? Yes, yes it is. The keyboard drawer doesn’t do much for most people, and the vast majority of them are not big enough that you are going to be able to fit both your usual gaming keyboard and your gaming mouse in there, and that means that you are going to end up either not using it at all or you are going to end up using it and dealing with the fact that it just is not a comfortable way to game. The fact is that if you’re looking for a decent way to be able to game, you’re going to have to resort, more likely than not, to having your keyboard and your mouse on the same level as your tower or your monitor. The best thing about this model is that it just looks better than a lot of the other L-shaped desks reviewed. It looks beautiful, and it will be a great addition to your home or office. So, you’re looking to get a desk for gaming. That’s great! It’s always good to have a dedicated area for anything that you’re looking to do, and gaming is a part of that. But picking out the right desk can be hard, and you’re going to want to know a few things before you go out there, wallet or credit card in hand, and start making purchases. Here are just a few answers to questions you may have. Well, that depends on what all you’re doing. But let’s calculate a few things. To begin with, you need enough space for your desktop, more likely than not. That means that you will need about 8 inches by 18 to 20 inches, for a total of 144 to 160 square inches. Of course, you don’t necessarily need to have your desktop tower on the desk, so that’s more a want than a need. Then, of course, there’s the keyboard. The keyboard will be about as big as the desktop we just mentioned, too, which means you can count in up to another 160 square inches. Then, of course, you’ll need about a 144-square inch area in which you can move your mouse (some people who like to make exaggerated movements will need to have a bit more). After that, you just need space for a monitor, and you’re good to go, and the size of monitors can vary wildly these days. Is Tempered Safety Glass Safe? Of course, it is, it has ‘safety’ in the name! Alright, all kidding aside, yes, tempered safety glass is generally safe. It is often used as a surface in things, in fact. It is sturdy enough to be used in fancy dinner tables for years on end. It also doesn’t crack so simply as regular glass will crack, which is a good thing. In fact, in my house I have a sheet of tempered safety glass that is a couple of decades old, and it isn’t cracked at all, although there are a few gashes in the glass, cuts that got there when it was being moved from one place to another or from having a plate dropped on it (hilarious story, the plate broke, the tempered safety glass did not). My point is that under normal use, it should be fine. And if you’re going to be doing something that will break it, you will find that you will probably end up breaking or heavily damaging any of the other tables that you would use. Now that we’ve taken a good look at the products offered, and had a bit of fun doing so, it’s time that we talk about which one may be the best for you and your home use. And, after much consideration, a conclusion has been reached. Overall, the best option is the Altra Dakota, if you’re looking for a desk that will be both a gaming desk and a work desk. But, if you’re looking for an outright gaming desk for your home gaming den or basement or whatever you have, then you will find that the Atlantic gaming desk will be your best option. It has everything that you could want in a desk, and it even comes with a handy place to hang up your headphones when you’re done gaming. Truly, a great option for the gamer. But honestly, no matter what gaming desk you decide to go with, you’re going to be happy if you choose one on this list. Trust me on that, these are some quality products that will give you years of use. Just make sure you do not end up spilling soda on it.